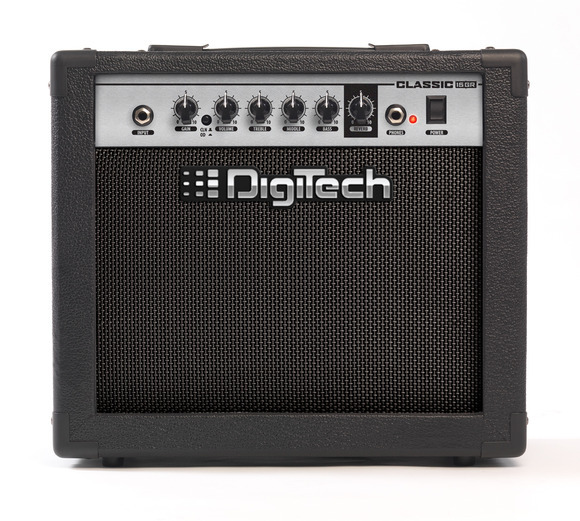 SALT LAKE CITY, Utah – HARMAN’s DigiTech today began shipping its Guitar and Bass 15-watt combo amplifiers. Combining DigiTech’s sound quality and tonal flexibility, the DigiTech amplifier lineup includes a two-channel combo amp, with reverb and a combo bass amp all equipped with eight-inch speakers. “DigiTech has the unique advantage of decades of experience in creating many of the world’s most recognizable sounds, effects pedals and products. These light-weight compact amps are perfect for in-home rehearsal, yet powerful enough to bring onto the stage.” stated, Rob Urry, VP HARMAN Professional Division and G.M. of Signal Processing and Amplifier Business Units. DigiTech’s DG15R, DG15 and DB15 combo amps offer an outstanding combination of lightweight, easy portability and superb sound, from rich clean tones to roaring distortion and everything in between. The DG15R and DG15 include Gain, Volume, Treble, Middle and Bass controls and a Clean/Overdrive switch, and the DB15 bass amp offers Volume, Treble, Middle and Bass, making it easy for players to create their favorite sounds. The DG15R also features a Spring Reverb that adds lush, ambient reverb. All models also feature a 1/4” stereo headphone output for private listening. HARMAN (www.harman.com) designs, manufactures and markets a wide range of audio and infotainment solutions for the automotive, consumer and professional markets – supported by 15 leading brands including AKG®, Harman Kardon®, Infinity®, JBL®, Lexicon® and Mark Levinson®. The Company is admired by audiophiles across multiple generations and supports leading professional entertainers and the venues where they perform. More than 20 million automobiles on the road today are equipped with HARMAN audio and infotainment systems. HARMAN has a workforce of about 12,000 people across the Americas, Europe and Asia, and reported sales of $3.8 billion for the twelve months ending June 30, 2011. The Company’s shares are traded on the New York Stock Exchange under the symbol NYSE:HAR.